Are you having a hard time managing your LinkedIn account? Have you ever wished you can maximize its potential for marketing? Here’s a compilation of LinkedIn tips that will surely make our LinkedIn profiles better. Thanks to Pamela Vaughan for sharing these tips. Read on. With more than 347 million users, LinkedIn is the most popular social network for professionals as well as one of the top social networks overall. But do you know how to use LinkedIn to its fullest potential? With new social networks sprouting up constantly, LinkedIn is a platform that often gets underutilized or put on the back burner. But the truth is, LinkedIn can be extremely powerful — especially when you’re aware of all the platform’s hidden features that don’t get nearly enough exposure as they deserve. So to help you master LinkedIn, we’ve compiled the ultimate list of LinkedIn tips you may be overlooking … but definitely shouldn’t. Before we dive in, here’s a quick little primer on LinkedIn for those of you who may be new to the social network. LinkedIn launched in 2003 and is currently the third most popular social network in terms of unique monthly visitors — right behind Facebook and Twitter. Think Facebook, but with a more professional feel. The social network is primarily centered around careers, and it enables users to connect and share content with other professionals, including colleagues as well as potential employers, business partners, and new employees. If you’re a business on LinkedIn, it can also be a fantastic marketing tool. We’ve divided our cheat sheet into three main categories depending on your goals for using LinkedIn — LinkedIn profile tips to optimize your LinkedIn presence, how to use LinkedIn for professional networking, and how to use LinkedIn for business and marketing. Click these links to jump to individual sections. Learn even more about how to use LinkedIn effectively by downloading our free LinkedIn guide here. 1) Customize your public profile URL. 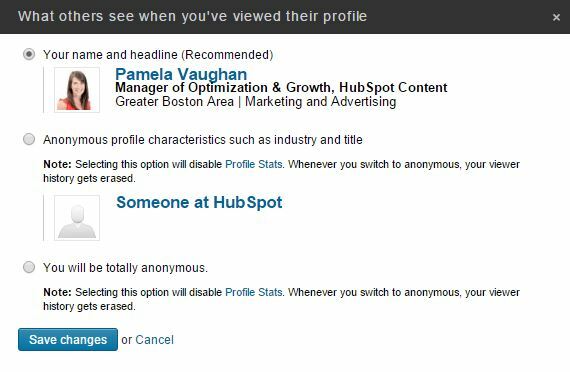 Make your personal profile look more professional (and much easier to share) by customizing your LinkedIn public profile URL. Instead of a URL with a million confusing numbers at the end, it will look nice and clean like this: http://www.linkedin.com/in/pamelavaughan. Customize your URL by going here and modifying your public profile URL on the right-hand side. 2) Add a background photo to your personal LinkedIn profile. In June 2014, LinkedIn finally jumped on the cover photo bandwagon and starting rolling out the ability for users to add a background photo to their personal profiles. 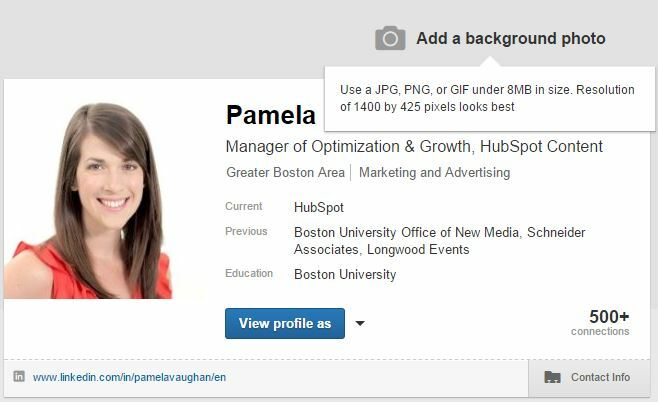 Give your LinkedIn profile a little bit more personality by adding a background photo of your own. Just keep in mind LinkedIn is a professional social network, so choose your photo accordingly. To add a background photo to your profile, click Profile >> Edit Profile in LinkedIn’s top navigation, then click Add a background photo at the top of your page (or modify an existing background photo by hovering over it and clicking Edit Background). LinkedIn specifies that your photo must be a JPG, PNG, or GIF file under 8MG in size and should have a resolution of 1400 x 425 pixels for the best look. Check out how HubSpot CMO Mike Volpe is using his background image, which shows the HubSpot executive team celebrating HubSpot’s IPO by ringing the NYSE opening bell in October 2014. 3) Create a Profile Badge for your personal website or blog. If you have your own personal website or blog, you can promote your personal LinkedIn presence and help grow your professional network by adding a Profile Badge that links to your public LinkedIn profile. LinkedIn has several different badge designs to select from, and you can configure your own here. 4) Optimize the anchor text for the blog/website links on your LinkedIn profile. Instead of using the default “Personal Website”-type anchor text links in your LinkedIn profile, you can change the anchor text to make those links more appealing to people who view your profile. So if you want to increase clicks on the website links you display on your profile, change those links’ anchor text to something more attention-grabbing than the standard options LinkedIn provides. For example, if you want to include a link to your blog, rather than choosing LinkedIn’s standard “Blog” anchor text, customize it to include keywords that indicate what your blog is about, like say “HubSpot’s Marketing Blog.” Each profile can display up to three website links like this, and they can be customized by editing your profile (click Profile >> Edit Profile from the site’s top navigation), clicking the Contact Info section, clicking the pencil icon next to your website links, and selecting Other in the drop-down menu. 5) Search engine optimize your profile. You can also optimize your profile to get found by people searching LinkedIn for key terms you want to get found for. Add these keywords to various sections of your profile such as your headline or in your summary. Did you know LinkedIn allows you to add a variety of media such as videos, images, documents, links, and presentations to the Summary, Education, and Experience sections of your LinkedIn profile? This enables you to showcase different projects, provide samples of your work, and better optimize your LinkedIn profile. Learn more about adding, removing, and rearranging work samples here. 7) Add, remove, and rearrange entire sections of your profile. LinkedIn also enables users to reorder entire sections of your profile in any way you prefer. When in edit mode, simply hover your mouse over the double-sided arrow in each section. Your mouse will turn into a four-arrowed icon, at which point you can click, then drag and drop to another position on your profile. You can also customize your profile with sections that apply only to you. Find a full list of sections to add to and remove from your profile here. 8) Take advantage of Saved Searches. LinkedIn allows users to save up to ten job searches and three people searches. After conducting a search, clicking the Save search option on the right allows you to save a search and easily run it again later. You can also choose to receive weekly or monthly reminders (+ daily for job searches) via email once new members in the network or jobs match your saved search criteria. Job seeking is one of the most common — and beneficial — uses of LinkedIn. Were you aware that LinkedIn enables you to turn your profile into a resume-friendly format in seconds with its Resume Builder tool? Just choose a resume template, edit it, and export it as a PDF that you can print, email, and share. 10) Find a job through LinkedIn’s job board. Now that you’ve generated that awesome new resume from LinkedIn’s Resume Builder tool, you can use it — and LinkedIn’s Job board — to help you land an awesome new position. Using its Advanced search feature, LinkedIn allows you to search for jobs by keywords, industry, location, company, experience level, and more. It even suggests jobs you might be interested in based on the information in your LinkedIn profile. Save some job searches like we suggested in tip #8 to get alerted when new jobs pop up, too! 11) Get endorsed for your skills. 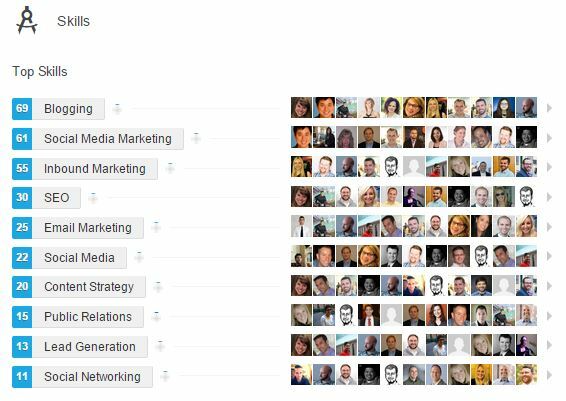 Back in 2012, LinkedIn launched a feature called Endorsements, which enables users to endorse their connections for skills they’ve listed in the Skills section of their profile — or recommend one they haven’t yet listed. These endorsements then show up on your profile within that same Skills section, as you can see in the screenshot below. Okay, so you can’t guarantee your connections will endorse you for those skills, but because it’s so easy for your LinkedIn contacts to do (all they have to do is click on the + sign next to a particular skill on your profile), you’ll find that many of them will do it anyway. Just make sure your profile is complete and you’ve spent the time to list the skills you want your contacts to endorse you for. It will definitely give your profile a bit of a credibility boost. You can also remove endorsements if you find people are endorsing you for skills that don’t accurately describe your strengths. 12) Use OpenLink to send messages to people you’re not connected to. Aside from the exception of your fellow group members (more on this in tip #19), LinkedIn only allows you to send messages to people with whom you share a first-degree connection. But did you know some people let you send them messages anyway, even if you’re not connected? The ability to be part of the OpenLink network is only available to premium account holders, but it allows them to be available for messaging by any other LinkedIn member if they choose to be. OpenLink members will appear with an icon that looks like a small ring of dots next to their name in search results and on their profile. 13) Request an introduction to someone you’re not connected to. Want to connect with another LinkedIn user but think it would seem too out of the blue? You can request an introduction to contact a 2nd-degree connection from a connection you both have in common. Simply visit the profile of the 2nd-degree connection you want to connect with, click the triangular drop-down arrow near the top of their profile, select Get Introduced, choose which shared connection you’d like to request the introduction from, and explain why you’d like the introduction. 14) Check in on Network Updates. Found on your LinkedIn homepage, Network Updates are essentially LinkedIn’s version of the Facebook News Feed. Check this feed periodically for a quick snapshot of what your connections are up to and sharing. You can also sort by Top Updates or Recent Updates to filter your feed in one way or the other. 16) Check out who’s viewed your LinkedIn profile. How? With the Who’s Viewed Your Profile feature, of course! This tool, which is accessible in the main navigation via the Profile dropdown, enables you to drill down into which other LinkedIn users have visited your profile page (so yeah, exactly what it sounds like). 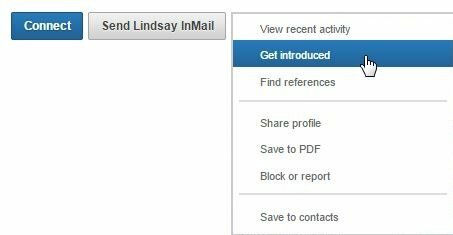 In fact, LinkedIn gave this coveted creeper feature a facelift in February 2014, so the information it provides is even better than ever. You can also see how you stack up against the profile views for your connections, people in your company, and other professionals like you. And if you’re interested in trying to boost the number of views to your own LinkedIn profile, we wrote a little tutorial about how to do it here. Want to transfer your LinkedIn connections to another contact management system? LinkedIn enables you to easily export your connections. Click Connections in LinkedIn’s top navigation, click the settings gear icon in the top right, and click Export LinkedIn Connections under Advanced Settings on the right. You’ll have the option of either exporting them as a .CSV or .VCF file. 18) Easily find new connections — or connect with old ones! Speaking of connections, the Connections tab in the top navigation offers a variety of other tools to grow and connect with contacts in your professional network. Click Add Connections in the drop-down menu to import contacts from your email accounts and get suggestions for other connections, connect with other alumni from your alma mater using the Find Alumni section, and use the Keep in Touch section to stay in touch with current connections, keep track of your communications, and get notifications when contacts in your network change jobs, have birthdays, or when you haven’t chatted with them in a while — either on desktop or in the Connected mobile app! 19) Leverage the perks of LinkedIn Groups. Did you know that if you’re a member of the same group as another user, you can bypass the need to be a first-degree connection in order to message them? In addition, group members are also able to view the profiles of other members of the same group without being connected. Join more groups to enable more messaging and profile viewership capabilities. 20) Take advantage of Advanced Search options. LinkedIn’s Advanced Search feature provides a much richer search experience. For example, say you want to find out if you’re connected to anyone who works at a specific company. Type the company name in the company field in Advanced Search, then filter the results by “Relationship” to see if you have any first- or second-degree connections to any employees. 21) Share your LinkedIn status updates on Twitter. Ever since the LinkedIn/Twitter breakup of 2012, you can no longer automatically sync your tweets to publish on LinkedIn (or even selectively by using the hashtags #in or #li in specific tweets). But don’t fret — the opposite is still possible! So if you’re ever posting an update to LinkedIn that you’d like your Twitter followers to see as well, you can easily syndicate that update to Twitter by selecting the Everyone + Twitter option in the Share With dropdown before clicking Share in the LinkedIn update composer. 22) Leverage @mentions in your status updates. In 2013, LinkedIn rolled out the ability to tag or @mention other users and companies in status updates — much like the way it works on Facebook and Twitter. Want another LinkedIn user or company to see your status update? Include the @ symbol immediately followed by the user’s/company’s name in your status update. As a result, that user/company will get alerted that you mentioned them, and their name will also link to their profile/page in the status update itself. 23) Optimize your Company Page. 24) Create targeted Showcase Pages. Showcase Pages are niche pages that branch off your main LinkedIn Company Page. They allow you to promote specific products or cater to your individual marketing personas, providing a more personalized experience for your Company Page visitors. LinkedIn users can also follow specific Showcase Pages without having to follow a company’s main page or its other Showcase Pages, allowing your business to tailor the page closely to the audience specific to the page. To create a Showcase Page, click the Edit dropdown at the top right of your Company Page and choose Create a Showcase Page. For more information about creating Showcase Pages, check out our beginner’s guide. 25) Post Company Status Updates (and target them!). Make the most of your LinkedIn Company Page by publishing Company Status Updates for all your page followers to see. This will give LinkedIn users even more reason to follow your Company Page, thus growing your LinkedIn reach. To learn how to enable LinkedIn Company Status Updates, read this post. Then learn how to create successful LinkedIn status updates in this blog post. Been using Company Status Updates for a while? Why not step it up a notch and leverage the power of segmentation with LinkedIn’s targeting options, which enable you to target your status updates to the Network Updates feed for specific users. Page admins can target their updates by criteria like company size, industry, job function, seniority, geography, or by including/excluding company employees. 26) Use Pulse to keep track of industry news. Pulse is an awesome section of LinkedIn where you can discover popular articles and trending content tailored to your interests. Browse through the Your News tab to see what people you follow are publishing, or the Top Posts tab to monitor the most popular content on Pulse in general. Use the Discover tab to find and follow specific influencer contributors, publishers, or topic-related channels to stay on top of news and stories in your industry. You can also sign up for daily or weekly email summary notifications of Pulse news (found in the Updates and News section of your Email Frequency settings), or instant notifications when influencers you’re following post something new. 27) Check out LinkedIn’s Content Marketing Score & Trending Content resources. If you’re a LinkedIn Marketing Solutions customer, you can learn how impactful your organic and paid LinkedIn content is with the Content Marketing Score and Trending Content resources. Your Content Marketing Score measures user engagement with your Sponsored Updates, Company Pages, LinkedIn Groups, employee updates, and Influencer posts (when applicable). It then provides recommendations for how you can improve your score, and thus the effectiveness of your LinkedIn content. You also can get a sense of which types of content are most popular on LinkedIn in your industry with LinkedIn’s Trending Content resource. It highlights the most popular content being shared on LinkedIn for various audiences and topic segments. Monitor this to understand what content your company should be creating and sharing on LinkedIn to generate the most engagement. To learn more about these resources, Marketing Solutions customers can contact their LinkedIn account executives. 28) Use LinkedIn to generate leads. In an internal study of HubSpot’s customer base, we found that traffic from LinkedIn generated the highest visitor-to-lead conversion rate (2.74%) of the top social networks, almost 3 times higher (277%) than both Twitter (.69%) and Facebook (.77%). So yes — LinkedIn can help you generate leads. To get the most out of LinkedIn for lead generation, promote and share links to your blog posts and landing pages in your Company Status Updates, where appropriate in LinkedIn Groups, on your Showcase Pages, and in calls-to-action placed in posts you publish via LinkedIn’s publishing platform, Pulse (see tip #33 coming up). 29) Experiment with LinkedIn Ads and Sponsored Updates. If you’re looking to complement your organic LinkedIn marketing efforts with some paid advertising, LinkedIn Ads aren’t a bad choice to consider. One of the biggest benefits of LinkedIn Ads? The targeting options! LinkedIn’s PPC ads let you target specific job titles, job functions, industries, or company size, to name a few — you know, the people who are more likely to want/need what you sell. If you want to get started with LinkedIn’s advertising platform, here’s a simple guide to setting up your first LinkedIn ad campaign. To learn specifically how to use LinkedIn’s newest form of advertising — Sponsored Updates — check out our free guide to succeeding with Sponsored Updates. 30) Use Group Statistics for better targeting and marketing. Another little LinkedIn gem that not a lot of users or marketers are aware of is the fact that you can access statistics for any LinkedIn Group — even groups you’re not a direct member of. To access the Group Statistics for a specific LinkedIn Group, click on the group, then click the gear icon in the group’s top navigation. Next, click Group statistics in the About section. Not only do LinkedIn Group Statistics tell you how many members are in a group or how active those members are; they also provide other key insights about the group’s members such as their location, seniority, function, and industry. Use this data to analyze the makeup of a group before you decide to join, identify which LinkedIn Groups you should target in your LinkedIn Ads (see tip #29), help guide you in the best ways to segment your Showcase Pages (see tip #24), or gather insights about your buyer personas to help you do better marketing outside of LinkedIn. 31) Create your own industry LinkedIn Group (or subgroups), and join other relevant groups. 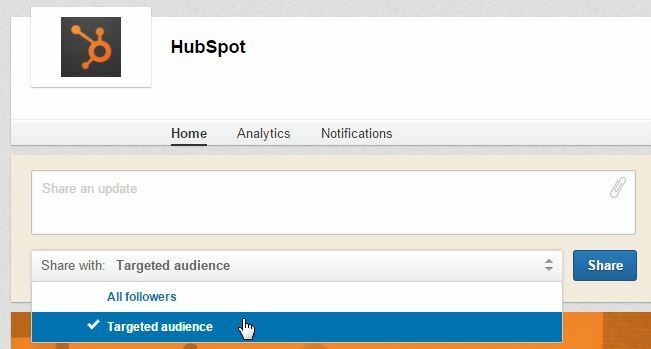 Or you could just create a LinkedIn Group (as well as subgroups if you’re so inclined) of your very own, like HubSpot did with our popular Inbound Marketers Group. Create a group based on a relevant industry-related topic, and become a LinkedIn Group administrator. You can then use this group to establish yourself as a thought leader in your industry, grow a community of advocates, generate new marketing content ideas, and even generate new leads! You should also consider joining (and getting executives from your business to join) other relevant groups and participating in discussions to exhibit thought leadership in your industry. 32) Email your LinkedIn Group. “Generate new leads from that group, you say?” That’s right! One of the perks of managing a LinkedIn Group is the fact that you can literally email the members of your group — up to once per week. These emails take the form of LinkedIn Announcements, which are messages sent directly to the email inboxes of group members (if they’ve enabled messages from groups in their settings). This is a prime opportunity for generating leads from LinkedIn, particularly if you’ve built up a robust group of users. 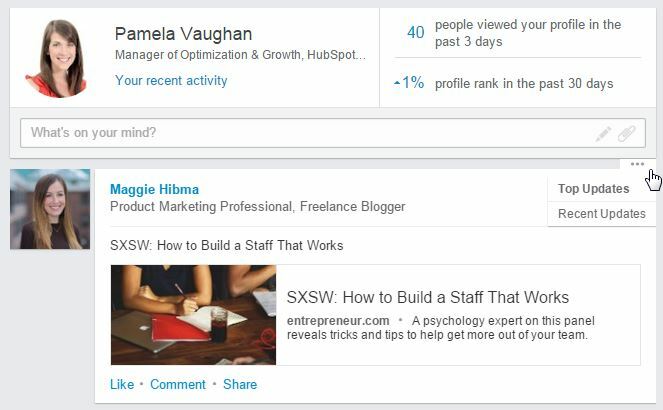 In fact, at HubSpot, our best performing LinkedIn lead gen days are usually the days on which we’ve sent a LinkedIn Announcement. Here’s how to get the most out of your LinkedIn Group emails. 33) Experiment with publishing content on Pulse (LinkedIn’s publishing platform). 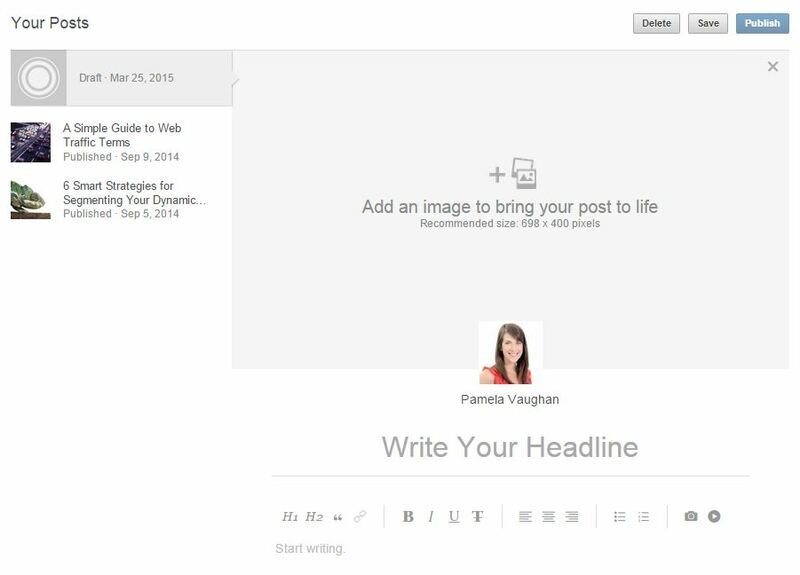 You no longer have to be a LinkedIn Influencer to publish new articles to LinkedIn Pulse. Publishing is now available to all users, ever since a February 2014 feature announcement. Experiment with how this feature can support your marketing goals by creating content for the platform and promoting it via your Company Page. For example, you could experiment with syndicating content from your business blog to LinkedIn Pulse and using it to promote subscription to your full blog. To publish an article on Pulse, click the pencil icon in the update composer on your LinkedIn homepage, and start writing! And if you’re looking for some inspiration, check out some of the most popular LinkedIn Pulse articles ever published here. Looking to fill a position or two on your marketing team — or anywhere else within your company, for that matter? Then be sure to build out the Careers section of your Company Page, which you can use to promote your available job openings. For more robust customization options for your Careers section, you can also purchase a Silver or Gold Careers package, which allows you to add a large, clickable cover image that can be transformed into a call-to-action. This image can direct users to a specific job, a list of jobs and opportunities located on your website, or examples of your company’s culture. The Silver or Gold packages also enables dynamic, customizable modules (that display different version of the page based on viewers’ LinkedIn profiles), analytics about who is viewing the page, direct links to recruiters, video content, etc. The look and feel of your Careers page depends on what information and images you choose to include, such as a list of jobs, people at your company, a summary section for your careers, what employees are saying about working at your company, and recent updates. Furthermore, if you’re actively recruiting candidates with specific skills and expertise, don’t forget about LinkedIn’s Advanced Search feature (see tip #20 above). 35) Use LinkedIn for sales prospecting and social selling. 36) Add the Company Follow and LinkedIn share buttons to your website/content. Promote your company’s LinkedIn presence and help grow the reach of your Company Page by adding the Company Follow button to your website. Furthermore, consider adding the LinkedIn Share button to your various content assets like blog posts, emails, and landing pages to extend the reach of your content to LinkedIn users. To learn how to build and use these buttons and more, check out our cheat sheet for creating social media buttons. 37) Analyze your LinkedIn marketing performance with the Analytics tab on your Company Page. So … how are your LinkedIn marketing efforts faring? Use the Analytics Tab for Company Pages to evaluate the performance of your Company Page. This tab offers data about the effectiveness of your page’s status updates, engagement, and reach, as well as information about your page’s followers — demographics, where they came from, how your following has grown over time, how your data compares to other companies, etc. Access your page’s analytics by clicking the Analytics tab in the top navigation of your Company Page. 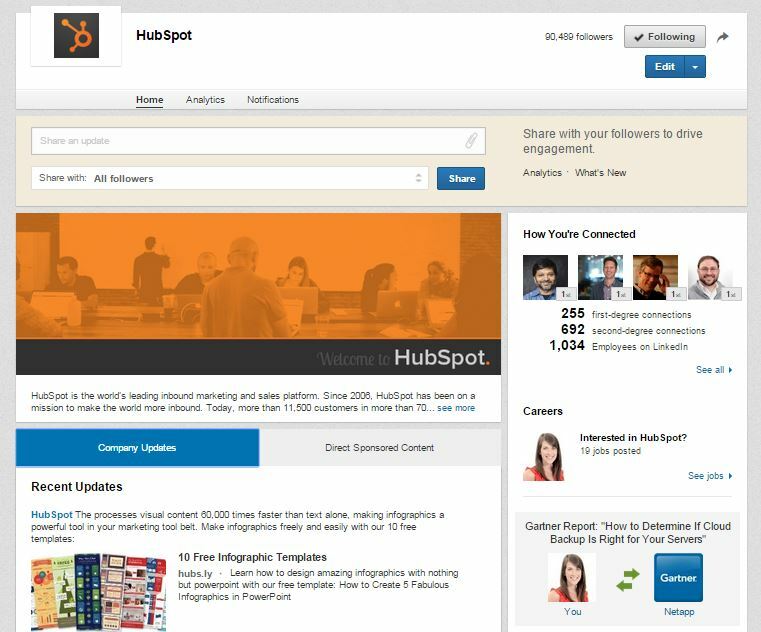 For even more analytics about how your LinkedIn marketing efforts are helping you generate traffic, leads, and customers, you’ll need a closed-loop marketing analytics tool like HubSpot. What other LinkedIn tricks do you use to make the most of your LinkedIn presence? Share them in the comments below! Editor’s Note: This post has been updated to reflect the latest LinkedIn features as of March 2015.